Want some additional visibility while helping to support SBAUG? You can display your card on our Members’ Business Card page for only $50 per year. 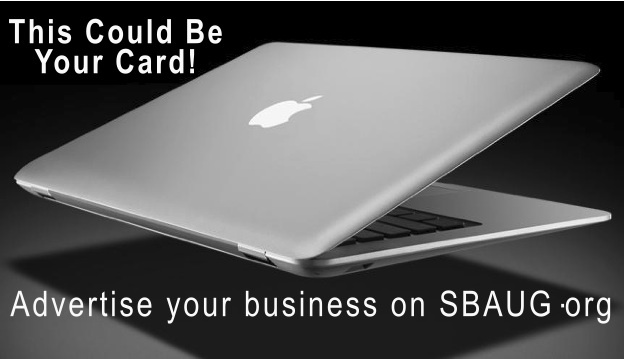 This offer is limited to SBAUG members. Not a member? Visit our Membership page and join us! Click HERE to visit the page where YOUR business card would reside! Specifications for artwork: Currently, we are accepting submissions for cards in the horizontal [aka landscape] AND vertical [aka Portrait] orientation. Size: Cards will be displayed in a size reasonably equivalent to 3.5 inches by 2 inches. High resolution images can be submitted, but may be reduced to 300 x 172 pixels. File format: For cards with solid colors or text only, please submit GIF, PNG or high-quality JPG. For cards with photographic images or color gradients, please submit JPG or PNG-24. Artwork in other formats may be acceptable too. Contact our Website Admin(s), for more info. Submitting artwork and payment: Send artwork to Website Admin(s), Please include a URL to your businesses’ website to use as a hyperlink associated with your business card graphic. Payment of the $50.00/year fee can be made by clicking the Pay Now With Pay Pal graphic or by clicking HERE.